Christ Church was opened on the 24th May 1821, but its roots go back much further in time, nearly 300 years before, to 1526. In that year a chapel of ease was built to serve the people of the townships of Warley, Norland and part of the township of Skircoat, in the ancient Parish of Halifax. It was situated on low-lying ground just opposite the junction of the Ryburn stream with the River Calder, between a fulling mill to the east and Sowerby Bridge to the west. It was modest in size, the dimensions of the land granted for the purpose of building the chapel being 26yds by 8 yds (about 24 by 7 metres) The accommodation was therefore also modest, but it should be remembered that, in 1526, Sowerby Bridge could not even be described as a village; there was a bridge, a mill, and the houses were far apart and scattered. In 1632, extensive alterations were made to the chapel and a gallery added to provide a total of 426 sittings. 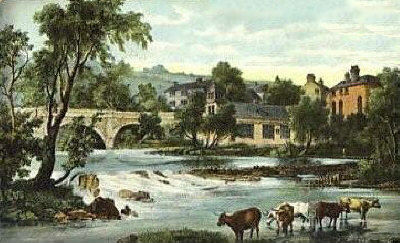 By the end of the 18th century, the Industrial Revolution had begun to transform Sowerby Bridge. The population was increasing and the accommodation and facilities provided by the chapel were becoming inadequate, apart from which, the building was showing its age and it was frequently flooded in the winter when the level of the river rose after a storm. In 1802, the Rev Richard Fisher died after serving as Perpetual Curate of Sowerby Bridge since 1746 and the Rev James Franks was appointed by the Vicar of Halifax as his successor. It is to him more than any other single person that we owe our present church, Christ Church. The year 1803 saw the first serious attempt being made to provide a new church, but, since no ground could be found at what was considered to be reasonable terms, hopes were dashed. Proposals were made to add a vestry to the existing building, but these never came to fruition. There the situation remained until 1817 when a committee was appointed to negotiate the purchase of land on which to build a new church with a burial ground. Measures were introduced to obtain the necessary finance but due to a difference that arose between the committee and the landowners, the negotiations fell through. However, Timothy Bates, who in 1786 founded the oldest engineering firm in Calderdale, (later to become Pollit and Wigzell Ltd), a member of the committee, offered to sell a parcel of land on a different site at a price agreed by the committee itself, subject to it being possible to obtain a contiguous plot. The owner was willing to sell and these two plots are the land on which the church now stands. A faculty was obtained from the Archbishop of York and on April 22nd 1819 the foundation stone was laid. Just over two years later Christ Church was opened, albeit under licence as the Archbishop was not in a position to carry out the consecration until 1824 due to his having many other engagements within his diocese which at that time covered a vast area. The architect responsible for the design of the church was John Oates of Halifax who produced what was described in 1836 as being “a handsome and commodious chapel of the Gothic order of architecture”, which provided 962 sittings. A much later opinion, that of Sir Nikolaus Pevsner in 1959 was that it was “a big church without the paperiness of so many churches c1820”. The exact cost of building the church is not known, but, including the price paid for the land, it almost certainly amounted to £6,500 and was possibly over £7,000. Less than a month after the new church was opened, the materials of the old church were sold by auction and it was demolished. The land on which is stood was eventually sold in 1823. “The Old Brigg Chapel” as it affectionately came to be known was no more. The ministry of the Rev James Franks, begun at the chapel in 1802 bridged the old and the new for he became the first incumbent of the new church. He died in 1829. At the end of 1828, a mere seven years after the church opened, it was found that the roof of the nave was unsafe. The ridge had sunk eight inches (20cm) in the middle pushing the crenellations and upper parts of the walls outwards, on the north side to the extent of four inches (10 cm). The church was closed for two months whilst the roof was propped as a temporary measure. Repair work eventually began in August 1830, the church being reopened on Sunday, 20th March 1831. The ministry begun by the Rev James Franks was continued by the Rev Charles Rogers who died in office in January 1863 after an incumbency of 33 years. It is an interesting indication of the growth of the population of Sowerby Bridge during this part of the 19th century that between December 24th 1848 and April 3rd 1857, the register records the baptism of 1080 children, 1002 by the vicar himself. His successor, the Rev John Ellison (1863 – 1887) was a man of action and a great organiser who, within a few years of his arrival, re-ordered the interior of the building. 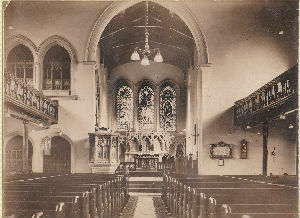 He was also responsible for the addition of the chancel in 1873/4. He transformed the Sunday School. In the field of education, he began the task of raising finance for the building of a school which, when built after his leaving, bore his name. In addition, he was instrumental in creating a new parish at Warley. Canon Charles Llewelyn Ivens in his 30-year ministry, begun in 1887, became almost a legend in his lifetime. His Men’s Services became so famous that they attracted men from far and wide – a packed church was quite common. It was after one such service on February 4th 1894 that disaster overtook the church. Fire broke out in the organ and spread to the chancel and nave roofs. The Sowerby Bridge and Halifax Fire Brigades performed heroically and, though the roofs were badly damaged, they did not fall in and the tower was saved. Tragically, Jonathan Coulston, one of the firemen fighting the blaze was killed when he fell through a trapdoor in the tower onto the steps below. Almost twelve months to the day on which the fire occurred, the church was re-opened. This took place on February 2nd 1895 after much repair and some alterations. The fabric of the church remained virtually unaltered for about 90 years during the incumbencies of Canon Maurice Curteis Elphinstone (1917 – 1933), Canon Hugh George Potter (1933 – 1936), and the Revs Douglas Walker Scott (1936 – 1946), Harold Palmer (1946 – 1956) and Frederick William Lambert (1956 – 1974). The Rev John Townend’s ministry began in 1974 and sadly ended with his death in a motor accident in 1985. He had barely arrived before it was necessary to replace the heating boiler. An infestation of dry rot then required treatment. Following this, the organ needed to be overhauled and was eventually replaced. Most serious of all, a further, more extensive attack of dry rot was discovered in October 1983 which necessitated major eradication treatment, repair and renovation work. The church had to be closed for several weeks. Ironically the situation presented an opportunity to adapt some of the existing facilities to meet present day needs. Notable inclusions here were the provision of accommodation for meetings and various activities, new toilets and a kitchen.